That scar is absolutely horrendous. No way I would do a strip. There in much more pain involved and doesn’t heal near as quickly as FUE. Dude do yourself a favor and don’t keepitshorter. » much more pain involved and doesn’t heal near as quickly as FUE. » Dude do yourself a favor and don’t keepitshorter. Who or what are you talking about? » » much more pain involved and doesn’t heal near as quickly as FUE. » » Dude do yourself a favor and don’t keepitshorter. » Who or what are you talking about? That dude who had the strip that is about 15 inches long. How about this scar. Has anyone seen Zayden? I have not seen him for a while. Also, has anyone seen punchnorwood? That is not a scar. That is a fresh incision with what appears to be stapels. Yes a rather large incision. I would describe a horrendous scar as an incision that heals and the skin stretches widening the scar and/or scar tissue builds up. This one may very well remain thin. I’m not pro strip, in fact quite the opposite, but to say that is a horrendous scar is an ignorant statement. » stapels. Yes a rather large incision. » very well remain thin. » horrendous scar is an ignorant statement. Regarding the original incision photo I think one should ask the patient if he thinks it is horrible or if he’s just happy with his new hair. He appears to be able to get away with a short hair cut so I doubt it’s an issue for him. This debate is obviously generated by those who do not understand the principles of FUT/Strip surgery so there is little point in debating because it seems like trying to educate to the unreachable. On the other hand I am glad I posted this because it may have educated a few and if it has put some off then that is not a bad thing either because it has shown they did not understand in the first place. You can make spurious comments all you like about the length etc, because you do not know it is hardly relevant or constructive; the fact remains the scar is clean, safe, healed very well at 9 months, enabling the patient to have a short cut and gaining a lot of hair. Thanks for your words, yes, I´m happy with the results of my HT, in fact I´m planning a new one to cover the back, so the look will be even better. Happiness is subjective, and he is happy, and that is what we are in the business of doing. Warm wishes to all for the festive season. If you want to take a lot of grafts to cover a large area then a long strip is logically going to allow a thinner piece of tissue to be removed and ultimately less likelihood of scar stretch. I have seen other first class clinics use this apprach. This IS the reality of good HT. If you don’t like the heat stay out of the kitchen. Complain about the heat but leave the cook alone, he’s doing a good job. O.K that’s a slightly surreal analogy. What do you think is remarkable about it taking 9 months for an incision, that WILL leave a scar, to heal is? An incision of the sort WILL leave a scar. Newcomers do NOT be fooled, and the chances are fair the scar will widen/stretch over time. If anyone tells you an insicion of this sort will NOT leave a scar tell them to shave their head and/or wear their hair extremely short after a procedure like this. » that WILL leave a scar, to heal is? » and the chances are fair the scar will widen/stretch over time. With respect you show ignorance to FUT and H/T in general, no one mentioned the word remarkable or no scars, by definition a scar is a scar, a blemish on the surface of the skin; I do not understand your need to embellish. Further more FUE; you seem to need to understand this technique also. 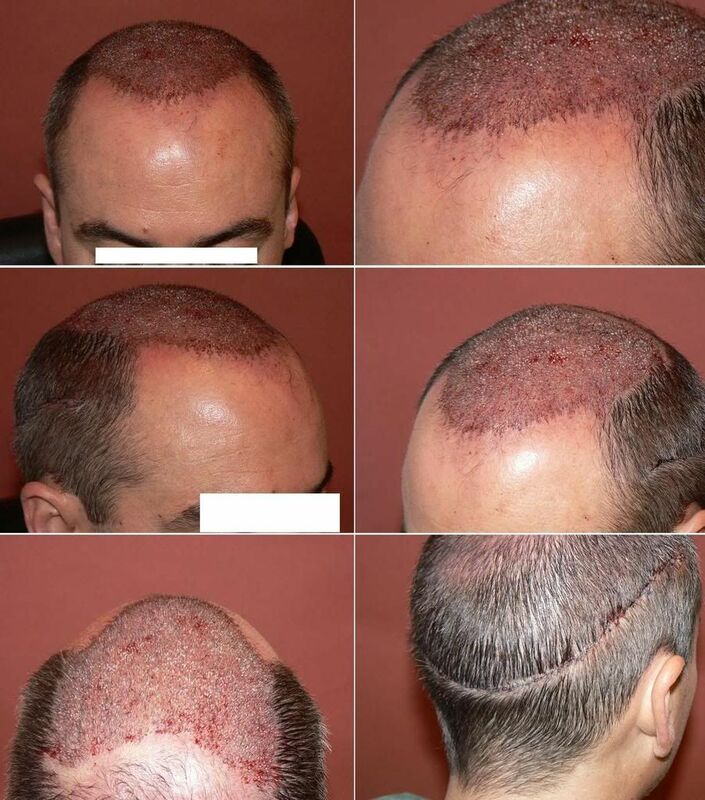 FUE leaves scars, if an incision is made into the skin and scar will be a consequence, be it 0.75, 0.9 or 1mm punch. If performed well, not over harvested and a clever extraction pattern and the scalp reacts well the scars can be minimal and not obvious to the eye, but they are still there. This has the advantage of allowing the person to keep their hair shorter and even shaved… but if anyone tells you it does not scar that is an untruth. The next two points are, ironically if the same procedure was carried out with FUE and taking into consideration the closure of this scar line, there would have been more scarring with FUE, just dispersed over the scalp rather than in a linear line. Secondly, obviously healing does take a matter of week or so with FUE, sometimes the punch marks are undetectable by 7-10 days but this does not mean the scalp is healed just the exterior healing is faster. The cumulative effect of open wounds over the scalp can put strain on the body as it has to serve each open wound thus sometimes slowing down the healing process, so a procedure of this size would be ill advised with FUE. It would not be prudent to go back into that same donor extraction area again for a further 6-10 months to allow the scalp to rest and return to normality. 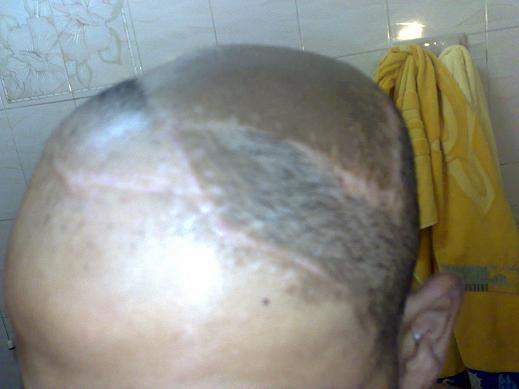 So there is no confusion, FUT leaves a linear scar, if performed to a high standard it will allow the patient to keep their hair short, but not shaved; FUE leaves cylindrical scars and again when performed to a high standard can be hard to see with the eye, in conjunction with other factors such as harvesting pattern and hair characteristics. FUT will allow for the mass movement of hair whereas FUE is a longer procedure and will not ultimately allow for the same number of natural groups, or FU to be removed; they are different techniques offering advantages and dissadvatages, in some respects although they are H/T techniques that is about as much as they have in common and should not be compared; but there is a need to understand because there seems to be a real lack of understanding about this; FUT vs FUE, there is no such battle because they are different. An arguement you can have if all parameters are equal and both techniques could have been used is then why one was chosen over the other, but that is not the case here. If this argument is all about scars, visible or not; I would suggest that do not have a hair transplant if you do not wish to be scarred, it is a prerequisite of having the procedure. Perhaps I should have been a little clearer in my post when mentioning scars. Just as you explained, when FUE is performed properly there are no visible signs of scarring from the donor area which allows an individual to keep his hair very short or even shaved. The same cannot be said for a strip procedure. With short hair if ones looks closely he can see where the strip was taken from, and one can most certainly not shave his head. That was the point along with the fact that there is more pain, soreness, and a much longer healing and recovery period with a strip procedure versus FUE. Strip procedure–visible scar with short or shaved head that can stetch and widen. Longer recovery period with soreness and pain involved. FUE procedure–no visible scarring ever if performed properly with very little, if any pain afterwards and a healing period of about a week. That was the ignorant point I was trying to make. » little, if any pain afterwards and a healing period of about a week. » That was the ignorant point I was trying to make. The poiunt that BHR was making is that if you removed the large umbers ued here then FUE WOULD give visible empty areas / scars / moth eaten look whereas with strip this is not the case but it does leave single long scar. I am sure that the ignorance that they intemated at was that in their view they have made it clear that FUE cannot just replace strip surgery and does have some limitations as well as advantages compared with strip. » » little, if any pain afterwards and a healing period of about a week. » » That was the ignorant point I was trying to make. » have some limitations as well as advantages compared with strip. The strip scars are pretty good now, but of course FUE has less scarring. could any1 tell me if Dr.woods can help me or not ? » while. Also, has anyone seen punchnorwood? Zayden, how are you? i thought someone said Dr. Rose or some Canadian doctor was going to treat you, that didn’t happen?